From a 2009 show not Fenway. performance that made Bruce Springsteen come off like a slacker. The personable legend could’ve ended it with a walkoff triple of “Let It Be,” “Live and Let Die” (complete with fireworks show) and “Hey Jude,” with the sold out crowd getting their La-Las out with extreme abandon. At the two-hour mark, the crowd would’ve gotten its money’s worth, even at ticket prices ranging from $60 to the mid $200s. But Sir Paul and his thumping four-piece band (drummer Abe Laboriel Jr. is a powerhouse who also sings nice harmonies) came out for two three-song encores, playing “Day Tripper,” “Lady Madonna” and “I Saw Her Standing There” in the first furious clump, then “Yesterday,” “Helter Skelter” and “Sgt. Pepper’s Lonely Hearts Club Band” to make the night spectacularly unforgettable. The tireless McCartney’s voice sagged only slightly, when he paid tribute to George Harrison on a version of “Something” that started on solo ukulele and ended in fullblown extravagance. It could’ve been the emotion, rather than ragged vocal chords that kept the singer from hitting the highest notes on that one. A photo montage of Harrison, most taken by Linda McCartney, played during the song. The gentleman rocker, who seemed genuinely touched by the crowd’s outpouring of love, also paid tribute to John Lennon on “Here Today,” a song written after his partner’s 1980 death about a conversation he imagined the two having. When McCartney said “Let’s hear it for John,” when introducing the tune, the crowd cheered for a solid two minutes, with Paul stepping back from the mike twice to let it continue. This was a lovefest, unmatched. The show had several configurations, including a solo acoustic set that gave the crowd “Blackbird” and McCartney at the piano for “Long and Winding Road. There was also ample time- too much, perhaps – devoted to newer songs from his band the Fireman and lesser post-Beatles projects. Twenty minutes shorter and the show would’ve been near-perfect. “Band On the Run,” however, was a standout from his Wings days, and “Let Me Roll It” had a nice touch, sequeing into a Jimi Hendrix nod. Timing is everything, they say, and this show, relying so heavily on Beatles nostalgia, may have seemed a tad out of place ten years ago. 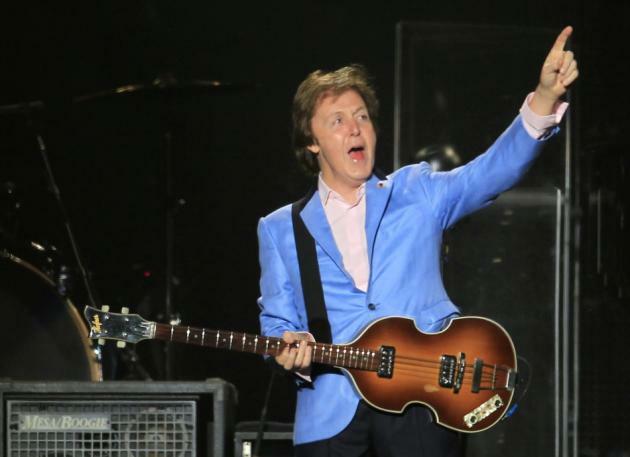 But on this tour of stadiums, which visits the new home of the Dallas Cowboys Aug. 19, McCartney is ready to wholeheartedly embrace his legacy. It’s a show you won’t forget, with a last hour that will take your breath away. This entry was posted on April 4, 2013 at 3:09 pm	and is filed under Uncategorized. You can follow any responses to this entry through the RSS 2.0 feed. You can leave a response, or trackback from your own site. I was a lot more excited about this article until I saw that it’s 4 years old. I saw McCartney on his ’02 tour and loved it. I was getting excited about seeing him again until I saw…um…this all happened 4 years ago. OK, never mind. I just got the clue.